These can’t be numbers to celebrate unless we begin to understand the responsibility of what these numbers represent. These two numbers represent the most people that have every showed up at Ada Bible Church on any given Sunday. These two numbers represent people who come from all walks of life who long to know and experience community. These two numbers represent families of all sorts who need Jesus’ love and strength to make it through another day. 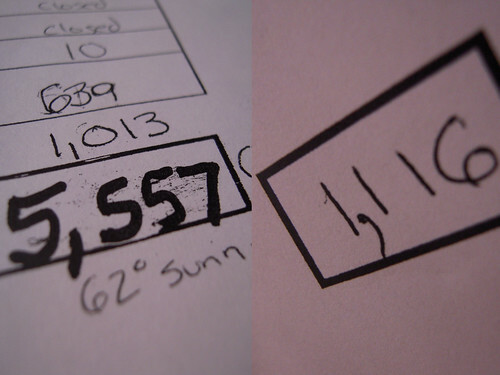 These two numbers represent lots of people who just need to feel like they belong to someone. These two numbers represent the fact that God is not finished with his mission through Ada Bible Church. Honestly, I didn’t expect these huge numbers. I hoped that this many people would show up to learn more about the First Church in Acts and how it relates to how we do church in the 21st Century. I hoped that we’d have this number of children and students who are just beginning to find out who Jesus is and what he wants for their life. But when I saw the numbers, I also saw the people that God wants to reach. I saw the number of people in West Michigan who still need to experience Jesus in a real way. I’m excited that God is on the move. I’m thrilled to play even a small roll in building his kingdom. I go back to the grind with a renewed energy knowing that being right here and right now is a really amazing opportunity. What simple thing has given you encouragement this past week?